Persistence of Memory (Salvador Dalí) Five-Watch Rating. La Taberna del Gourmet, the Perramón-San Román restaurant that Geni Perramón San Román's runs in Alicante, was named "La Mejor Barra de España" (The Best [Tapas] Bar in Spain) at the Lo Mejor de la Gastronomía Conference in Alicante. The culinary genius in the kitchen of this incredible tapas restaurant-bar--which myself (and others) have thought for several years was the best tapas restaurant in all of Spain--is María José San Román, an award-winning chef, one of the best cooks in the country. 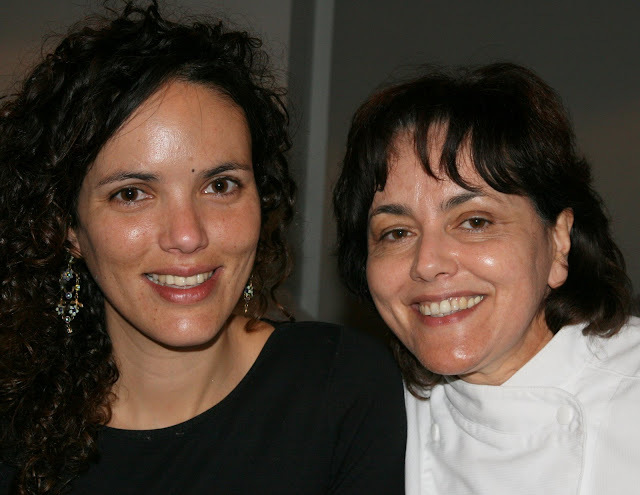 Geni & María José at La Taberna del Gourmet. Photo by Gerry Dawes©2008. 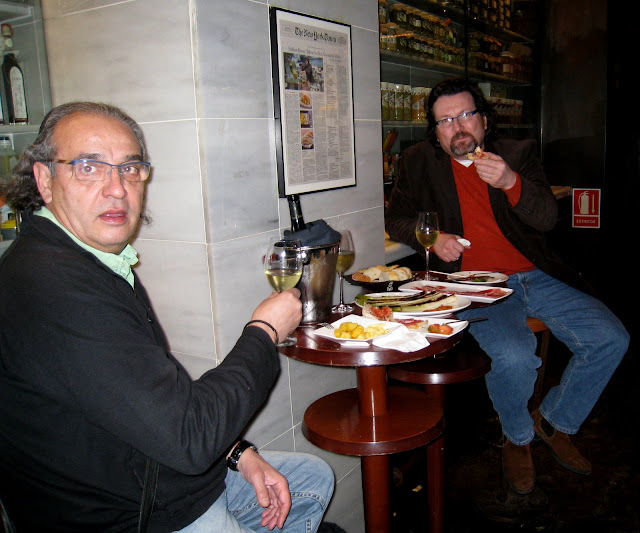 Michelin Two-Star, New York Times Three-Star American Chef Terrance Brennan of Picholine and Artisanal Bistro & Fromagerie in New York City says, "La Taberna del Gourmet is the best Spanish tapas bar I have ever eaten in." Pitu Perramón & Terrance Brennan at La Taberna del Gourmet. San Fernando 10, Alicante. 965-204-233. María José San Román is a creative cuisine chef who opened this phenomenal, quality product-oriented, tapas bar-taberna-restaurant next to her Michelin one-star Monastrell restaurant. La Taberna soon cannibalized her temple of vanguardia cuisine restaurant, so she moved Monastrell down the street to the fancy Hotel Amérigo (see below), so she could use the Monastrell space as an extra dining room for her tapas emporium overflow. María José's superb, quality product-driven, taberna, tapas and wine bar is one of the best traditional cuisine restaurants in La Comunitat Valenciana. La Taberna del Gourmet is run by English-speaking Geni Perramón, daughter of María José and "Pitu" Perramón (El Portero ). My recommendation at La Taberna, which is also Pitu's (legendary former goalkeeper for the Spanish national handball team) pride and joy, is to put yourself in the hands of Geni and ask her (drop my name) to do a tasting luncheon of her mother's stellar modernized traditional offerings. Depending on the season, a "small" sampling luncheon may include such dishes as little Navarrese txistorra chorizos; a shared portion of arrós con magro y verduras (paella-like rice with pork and vegetables), maybe the best patatas bravas (saffron-infused) in Spain; splendid, supernal gambas rojas (legendary prawns from the Alicante coast); and unbeatable grilled sepionets (small cuttle fish). Now that the preliminaries are out of the way, go on with white esparragos de Navarra with a vinagreta de solera de requena (aged vinegar); an ensalada méditerranea (arugula, goat cheese cubes, tomatoes and siurana olive oil); spectacularly good croquetas de chorizo Ibérico; equally spectacular alcachofa a vinagreta (artichokes); pan con tomate y anchoas (bread rubbed with tomate and topped with house-cured anchovies; a little escalivada montadito con foie (grilled vegetables on a toast round with foie gras); riñoncitos de lechazo (milk-fed lamb kidneys) and finish up with a bit of arrós caldoso con cigala y sepia en dados (a delicious soupy marinera rice with chunks of Dublin Bay prawns and sepia cuttle fish). After such a light repast, a little dessert won't hurt, so try María José's bizcocho de tocino de cielo, borracho de lima, freson and helado de gengibre, a take off on the classic, normally sinfully rich, lighter in this version tocino de cielo (read eggs and sugar), with lime, strawberries and ginger ice cream. Or course, you don't have to do this whole-nine-yards-menu--which I am very honored to say is now called "MENÚ DEGUSTACIÓN “GERRY DAWES" - - you can tell Geni when to stop anytime. Don't be surprised if you encounter the likes of a Michael Jackson sibling, Francis Ford Coppola, über chef Ferran Adrià or top Spanish chocolatero-pastelero Paco Torreblanca hanging out here, as the photographs on the walls attest. Hotel Amérigo, Rafael Altamira, 7 03002 Alicante, Spain 965 146 570, just a block of the lively palm tree-lined Explanada, the recreational port and the beach. Downstairs is María José's slick new barra Monastrell tapas bar and upstairs is her transplanted cocina de vanguardia Monastrell Restaurante, many of whose dishes feature the world's most expensive spice, saffron, as an ingredient. The Perramón-San Román also has the fun-and-funky (get photos of the funky decorations on the outside of the bar) Tribeca Music Bar Old Frankfurt and American Diner (just around the corner from La Taberna del Gourmet; best hamburgers in Alicante! ), El Mejillón (a mussels bar) on La Explanada (just a block from La Taberna del Gourmet) and Asador La Vaquería, (a grilled meat and fish house), carretera de Benimagrel 52 (just off Muchavista beach in Campello, a few kms. northeast of Alicante).